Grilled cheese like you’ve never had it! Celebrate grilled cheese month (or any month!) 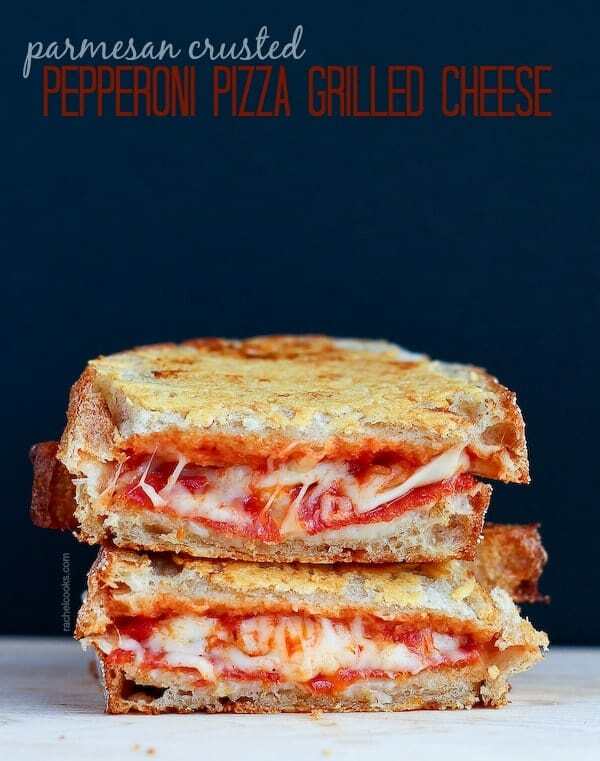 with this Parmesan crusted pepperoni pizza grilled cheese recipe. I think it was in an exercise physiology class or something along those lines and we were talking about nutrition or something and two or three days in a row it just so happened that we talked about lunch or something and I had grilled cheese. That was a lot of “or somethings.” My memory isn’t my strongest suit. Anyways — I was in grad school. I didn’t have a lot of money. Cheese and bread were a cheap, easy, and oh-so-delicious meal solution. Great to make and eat quickly before heading back out to the library to study for houuuuuuurs on end. Hours. And hours. So I’m in Physical Therapy school and they called me the grilled cheese queen. Not at all embarrassing. People in classes ahead of me even knew me by this name. Whatever, I’ll own it. Grilled cheese is clearly one of the best foods known to man. And it’s so adaptable! Add bacon. Add a huge, tasty, juicy tomato (those are coming eventually, right? ), add pesto, add whatever the heck you want. Or whatever you have in your fridge. I’m also obsessed with anything “pizza.” Maybe it’s because of my toddlers, but more likely, it’s because of me. Pizza Quinoa Stuffed Peppers. Pizza Lasagna Rolls. Pizza Macaroni and Cheese Muffins. 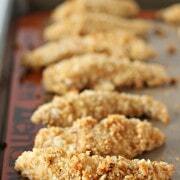 Pizza Chicken Tenders. Pizza Pizza Pizza. Oh my goodness if you want to dive into my archives and horrible photos, there are even more. Pizza turkey burgers, Pizza baked pasta and pizza paninis. But it’s grilled cheese month, not pizza month. 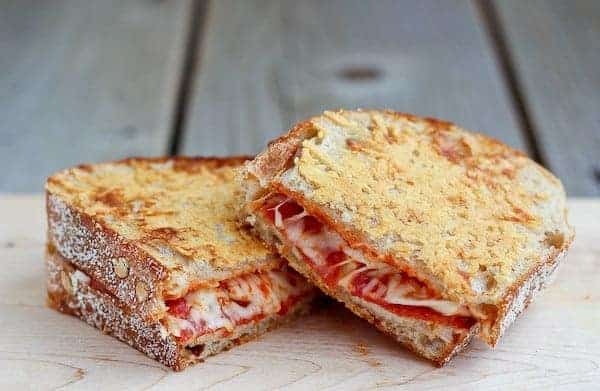 This pizza grilled cheese sandwich is stuffed with pepperoni, pizza sauce and mozzarella cheese. And if that weren’t enough, it has a crispy Parmesan cheese crust that takes it right over the top! Butter one side of each slice of bread with softened butter. On unbuttered side of one slice, spread on pizza sauce. Then add about 3 tablespoons of the mozzarella, lay out the pepperoni, and then top with the rest of the mozzarella and the other slice of bread. The buttered side should be on the outside. On one buttered side, spread 1 tablespoon of grated parmesan cheese and press down gently. Place this face down on a skillet or griddle heated over medium heat. Top the other buttered side (should be face up in the pan) with the rest of the parmesan cheese. 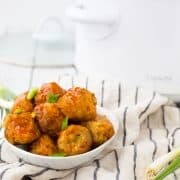 Cook for 4-6 minutes on each side or until golden brown and cheese on the inside is melted. Enjoy immediately. 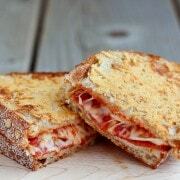 I absolutely love the Parmesan crust idea for this tasty grilled cheese! One cannot eat too many grilled cheese sandwiches in her lifetime. That’s my motto. ;) This pizza version looks so scrumptious! You know I want it !!! Grilled cheese is one of my favorite meals! Will attend the party! This sammie is AWESOME and I know all of us would enjoy it. Ok this is seriously calling my name. So genius! I did not know it was Grilled Cheese Month. This particular sandwich would take the cake for the title of Best of the Lot. So you realize by ‘taking the cake’ one would have dessert too. I know it’s lame, but I am laughing. What an awesome treatment of a classic food item. Grilled cheese and pizza — a match made in heaven! This looks so yummy! 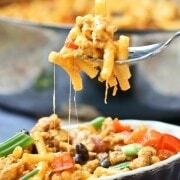 It can be made easier and less messy, though by using sliced mozzarella rather than shredded. Um I want to crawl in that thing and never come out. The crispy parmesan crust sold me! Yum! Oh I love that! Food memories are the best! Thanks for sharing and for taking the time to come back and leave a comment!